I've been a bit of a blog slacker lately. I prefer to be in a certain state of calm to reflect and write, and that state has been rather elusive of late. Most days it's like "fasten your seat belt and hang ON!" and I get to bed and think "was that really just one day? All that happened in just one day?!" Don't get me wrong, it's all good, but the cup runneth over with family, work, and training. That's about two hours more than this time last year, mainly due to increased swimming and a bit more running, the things I am loving the most right now. Did I say I am loving swimming? Swimming? YES, swimming! I'm having a lot of fun and success with the Vasa Ergometer. I've had it for about 7 weeks and I'm in the fifth week of the pilot triathlon swimming program under Coach Eric Neilsen (here's his blog). If you look at that top picture, I am now swimming SO fast that conventional cameras can only show my one arm as a blur, and the other arm can't even be seen at all! 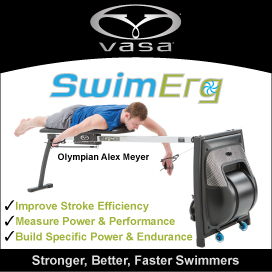 All kidding aside, the Vasa Erg has surpassed my expectations in every way - fun, intensity, challenge and results in the pool! I look forward to those weekly workouts which generally include two stand-alone workouts and one pool-warmup workout. I have seen direct and measurable results in the pool each week (see Vasa Training Log). Yesterday at the end of a 1200y main set I had two fast 50's and knocked them both out in 39s which was a first for me. The whole time I was thinking "powerful pull." The Erg workout two days prior to this involved "Power Pulls" of max wattage so I tapped into that same feeling of lat engagement, "open" armpit, shoulder rotation, and early vertical forearm to get the most power out of my stroke. It was one of those "ah-ha" lightbulb swim moments. 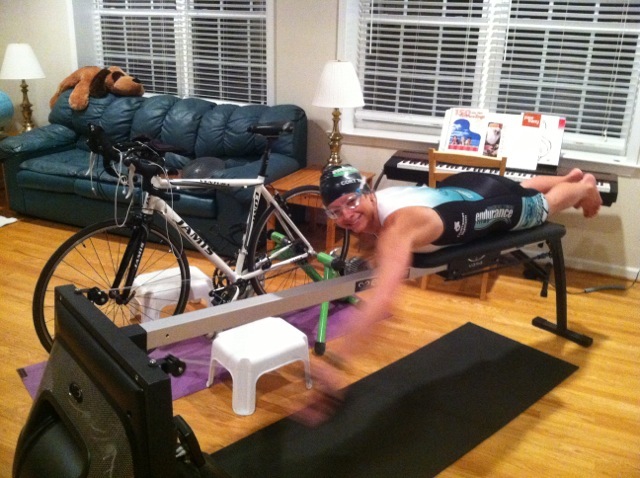 I really AM that excited about the Erg. All I can say is that for me, the Erg has been invaluable to hone in on that critical high elbow catch (still working on it) and develop power. It'll be fun to see where I am a few months in, but it's been really motivating and the perfect change-up that I needed. 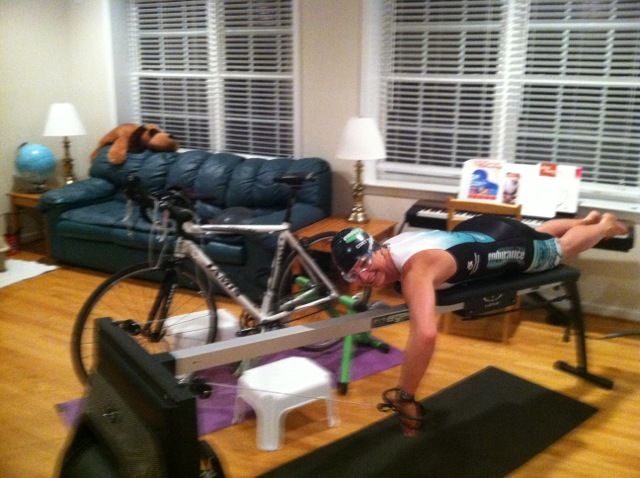 The other thing I like is that of all the training I do, the Erg takes the least amount of preparation and accessories. Throw on shorts, grab a towel for the sweat, and GO! Wait, what do you mean I don't need to wear a swim cap and goggles? I was invited to contribute my perspective on the convenience factor to the Vasa blog and did so with a post entitled, "Vasa Ergometer Training Saves Time, Money... and a Mother's Sanity" I used their Cost Savings Calculator but it was quickly evident that it is a really efficient (and effective) way to go. Incidentally, you can also buy accessories to change the Erg into a rowing or paddling machine - something I am thinking about for the kids. This weekend I am running in the Blacksburg Classic 10-miler, one of the few road races I do, but a good check-point on my way to Boston. Coach Jim very specifically laid out a race plan that I intend to show that I can follow. Normally I feel some pressure for this home-town race, but this year I really don't as my eyes are squarely focused on Boston and the tri season ahead. I plan to just relax and enjoy this race. I'm looking forward to it! Hope all is well in your universe!